Today begins my fourth week in the antepartum unit. 21 days down, and, if all goes according to plan (and honestly, what has in this pregnancy?) I'll be here for another 7 weeks before being released on my own recognizance (with promises of staying in bed) until the baby's debut. Funny to think that in the midst of all this crazy, technically, this is our downtime. There will be no breather. No getting back to a normal routine. Once this part is over, we'll have a baby. I'm only expecting further crazy from here on out. 1. 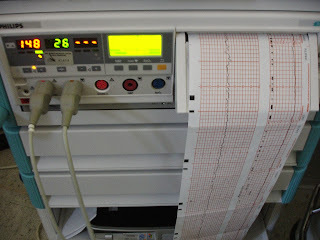 Our baby's heart rate: every time they put him on the monitor, the nurses rave about how our baby's heart rate doesn't look like a 25 week old baby's but more like a 30 weeker, something about great acceleration patterns. They brag to the doctors about it. The ridiculous thing is how smug this makes Mark and I feel, seeing as we (and presumably the baby himself) have absolutely zero control over this one. I'm fully prepared for our son to never meet a milestone anywhere close to on time from here on out as retribution. 2. 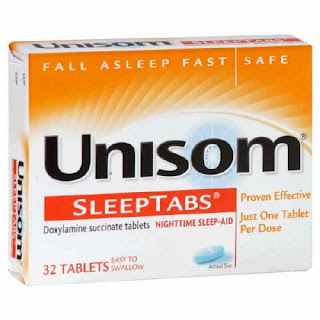 Unisom: all you pregnant ladies out there, the ones who get insomnia, this is what they give you in the hospital when they don't want to prescribe Ambien (although in a pinch, they'll give that to a pregnant lady too, but I haven't needed it). It's available over the counter (here's hoping that buying our own at Walmart really will make a difference in our hospital bill) and helps you get to sleep, but no need to have a guaranteed full 8 hours of slumber available to you before taking (Cough, Nyquil). It only lasts about 6 hours, so while I'm practically asleep by the time we finish our bedtime rosary, I'm awake enough to give them my arm for a bp reading come 4 am vitals time...and by 5 am rounds, I can even answer the residents coherently. All in all, I guess you could say it's been mildly effective; every little bit helps. *I am not and nor have I ever been a medical professional. Take any advice at your own risk...with a grain of salt and a heaping pile of common sense. 3. 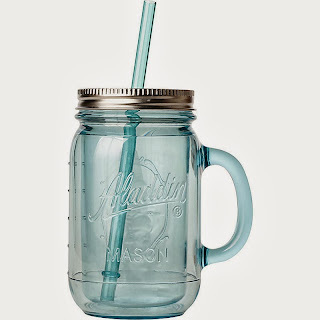 My mason jar/tervis tumbler. Keeps my water cold, and condensation free. 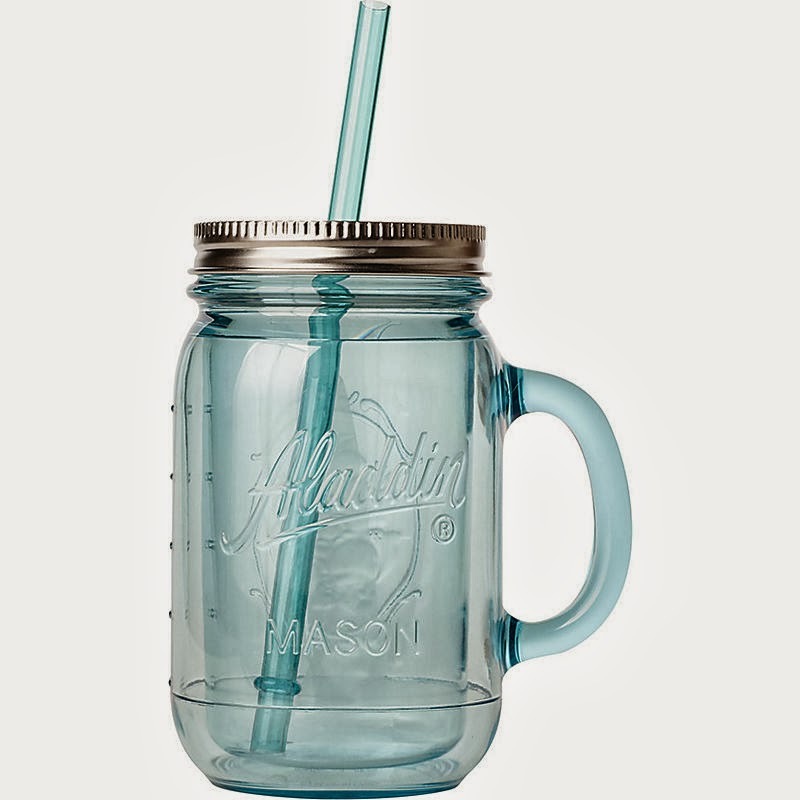 I can pretend I'm sitting on a back porch somewhere sipping iced tea. 4. As many times as I've been grateful for the internet over the past few weeks, I've also been a little disappointed in myself. I'm an English major for crying out loud, are there no books I can read? When else will I have this much time on my hands ever again? Slowly but surely, I'm becoming a little less shameful in my reading habits. 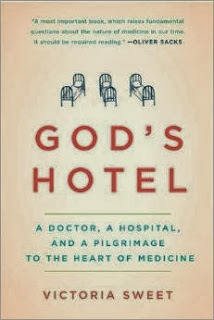 A friend lent me a copy of God's Hotel, a memoir of sorts by a doctor who worked for 20 years at one of the last almshouse hospitals in the U.S. The book starts out in the 1980's in San Francisco. Even though the 1,000+ patients at Laguna Honda are mostly there because they are indigent and the County Hospital doesn't know what else to do for them, Dr. Sweet, the author, loves practicing medicine there because in spite of it's old fashioned equipment, she is free to practice without any HMO's breathing down her neck, to get to know her patients, and to give them the time they need to heal. While working part time, she pursues a PhD in the History of Medicine, her focus of study being on medieval medicine and the writings of St. Hildegard of Bingen, a German nun from the 12th century. The author's interest in pre-modern medical treatments draws an interesting parallel to the way she was trained to practice medicine in modern times. Full disclosure: I haven't quite finished the book yet, but it is the first book that has held my attention since I was admitted to the hospital, and if that isn't a ringing endorsement, I don't know what is. Also, some of the descriptions of patients can be pretty gritty, so keep that in mind if you are weak of stomach. Linking up with the Spiciest Housewife. 5. YouTube crochet tutorials. The last time I started a crafty project was before my nephew, known as Peter over at Housewifespice, and sometimes known as #indignant17yo on Twitter, was born. That little cross stitch bib is still in a closet, unfinished, at my mom's. But I am a failure no longer, thanks to tutorials on YouTube and free patterns on Ravelry.com, I have now actually completed a project. It may have taken 2 summers and strict bed rest to make it happen, but I have now completed a crochet baby blanket. No mountain is too high. What will I conquer next? Is knitting in the round, with the connected needle things too close to the sun for this beginner? Also, don't look too hard at the picture of the blanket. Technically the edges aren't quite square. OMG! I love that blanket! I cannot crochet to save my life. I was thinking about sending you some crafty stuff....maybe I will yet. So glad my birthday baby is staying put. Have you read Call the Midwife, the book? Do NOT read Baby Catcher by Peggy Vincent while pregnant, but in 7 or so weeks, you'll like it. I second Colleen -- you a rockstar, woman. Is there nothing you O'Brien women CAN'T do??? Love that blankie!! Still praying over here. Stay in there, little baby!! This is Emma (Martin's schoolmate's wife), coming out as a follower (so I stop feeling like such a creeper). You're so funny, way to go on the 25 weeks! I can't imagine being in the hospital for 21 days & knowing there's still at least 7 weeks ahead, but I certainly understand doing whatever it takes for your son! I say cling to any positive thing you want to! Baby's heart accelerates like a rock star? AWESOME. You made a blanket? More awesome! I will have to add that book to my growing book list. Though seems more like a daytime read for me so that I stay awake and don't get creeped out by the descriptions. Anne, the blanket is beautiful, you talented girl! All the Bazins are so proud of you for doing exactly what God wants you to do: lie down and stay! :) Love to my awesome daughter-in-law and grandson! Circular needles are absolutely no more difficult than straight needles, and they have complex-looking cred from uncrafty people. I say go for it. And yay for baby staying put and growing! Fingers crossed for it to keep that way! So glad to hear an update about Baby Bazin. I was going to badger Jessica for news. Prayers coming from Connecticut. That blanket is so cute. I'm a sucker for knitting and crocheting. I think I prefer knitting in the end... it's not hard! Also, glad to hear things are still going well with the baby staying put! Thanks for updating!! Continuing to pray that your baby stays put for many more weeks.